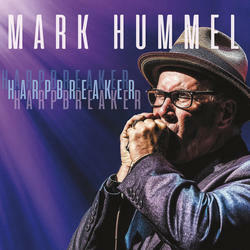 All Instrumental Blues Harmonica album with Blues Guitar Legend Special Guests. Large Ad in the Fall issue of Living Blues magazine. 200 plus promos will be mailed to U.S. Blues radio markets as well as Blues print media. Todd Glazer promotions will be hired to track and promote the album. Grammy nominated Blues Harp Legend Mark Hummel unleashes an all instrumental Harmonica album, and it redefines the scope and beauty of what the instrument is capable in the right hands. Joining Mark and his stellar band are Blues Guitar Legends: Anson Funderburgh, Little Charlie Baty, Chris "Kid" Andersen, Billy Flynn and Rusty Zinn. Featuring newly recorded, live, previously released and unreleased material. Recorded, mixed and mastered at Kid Andersen's famed Greaseland Studio in California as well as at Joyride Studio in Chicago. Blues harmonica and Guitar aficionados everywhere will be delighted with the standard of excellence attained on Harpbreaker.